For me option 1 isnt an option as i personally think using a Windows Server then bending it to be a RP isnt viable and one i wouldn’t suggest to my clients. Option 3 is only a option if you have a citrix netscaler going spare. Again i wouldn’t be rushing out to buy a Citrix Netscaler if i had other options. That leaves the second option which is my default option for my clients who are looking to purchase a RP. You heard it hear first KEMP will become the default mantra of Reverse Proxy for Lync going forward. To start with you need information from your Lync environment around the external Web services. ie: Name etc. 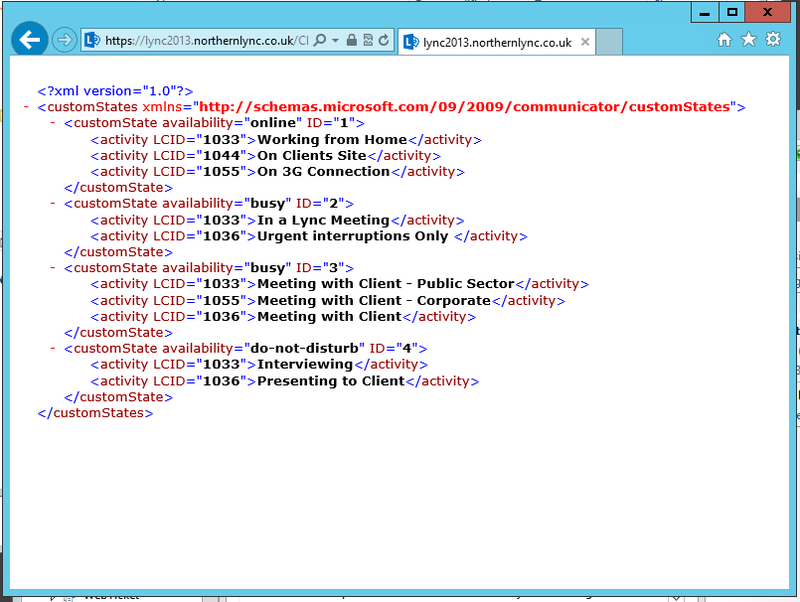 For me, my labs external web service is called LyncWebExt.northernlync.co.uk. Also i will be requiring a public certificate for the KEMP appliance. There are many public authorities out there which can provide this. <At the time of writing GoDaddy are the most competitive in pricing for UCC Certificates) NOTE: If you have a wildcard certificate this can be used on the RP as well. ***Please be sure your public cert has the following on it. 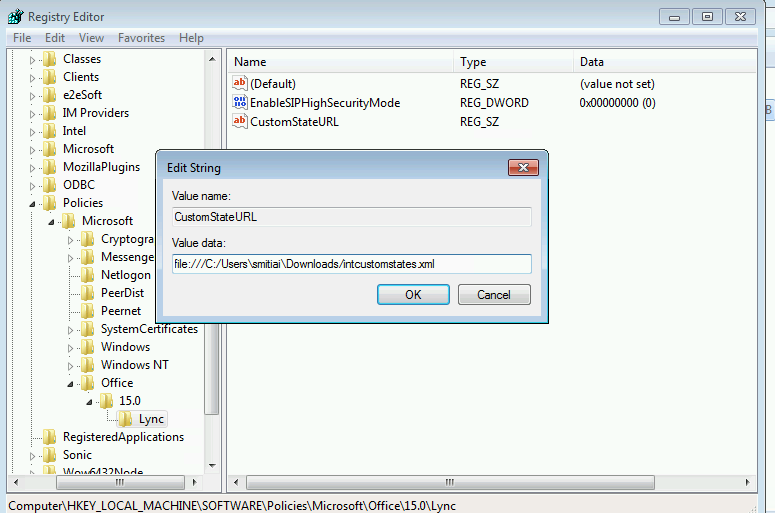 SAN Name = <Your Lync External Web name> – e.g. LyncWebExt.northernlync.co.uk in my case YES Put it in as a SAN as well!!! So with our information at hand and our certificate provisioned lets move onto the steps required to setup out Kemp. ALSO: Typically the KEMP appliance for Lync Reverse Proxy, requires be located within your DMZ and NOT on your internal domain.! Now we are on the console of the appliance lets start making the base line changes around the IP’s, local users and passwords etc. NOTE: once this is complete the appliance will reset itself onto that IP so be sure you can navigate to it. Again from the Systems Configuration Menu we are now set give the appliance a name. 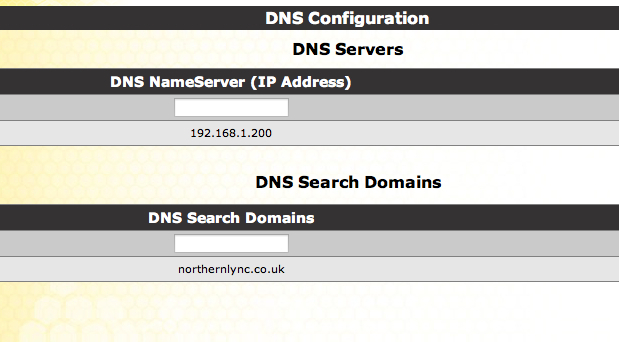 To do this select local DNS Configuration, then hostname Configuration. Now add the hostname of your choice. Next we need to select the Route Management Option from the Menu and select default Gateway. So that is it for the step2 baseline config. You can if you feel necessary add Logging Config etc. I wont go into enabling that as its simple and straight forward to setup. so jumping back up the menu tree to the top we are now going to create a virtual server. For understanding the virtual server is the DMZ IP address to which the appliance is listening on. e.g your public IP will come inbound to your Firewall, then the firewall should Nat this through to your DMZ on a natted IP address which will match the virtual server IP of your Kemp Appliance.!. The port you are attaching to this virtual address is 443 as all traffic bound for the Kemp RP will be routed through 443, Next add a service name as an identifier <LyncMobility>, then the last step the Protocol is TCP. You will then automatically jump to the properties page for the Virtual Machine. This is where you do the main config and server creation. Now select to expand standard options. 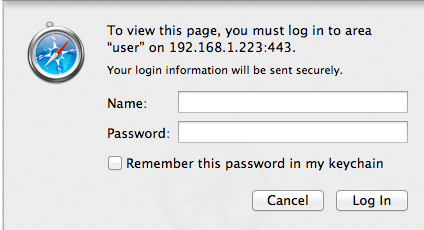 then select the option for SSL Acceleration = Enabled ! NOTE: you will get a warning about no certificate being available for the appliance. just ok this. — Ignore advanced Properties as nothing needs changing on this. Now dependant on you default gateway you might be required to select an option in the miscellaneous option under network options to allow you to add a Real Server which is not in the default gateway IP range. Thats it. the set up is complete. 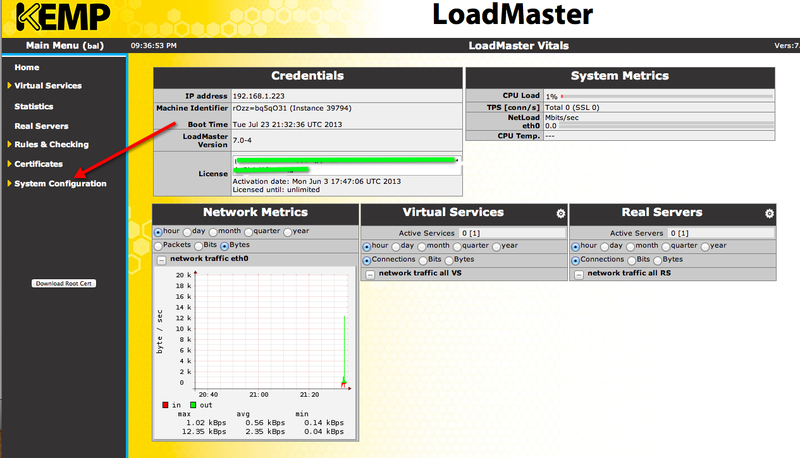 Jump back to Virtual Servers and select View. you will see your service as UP and working. 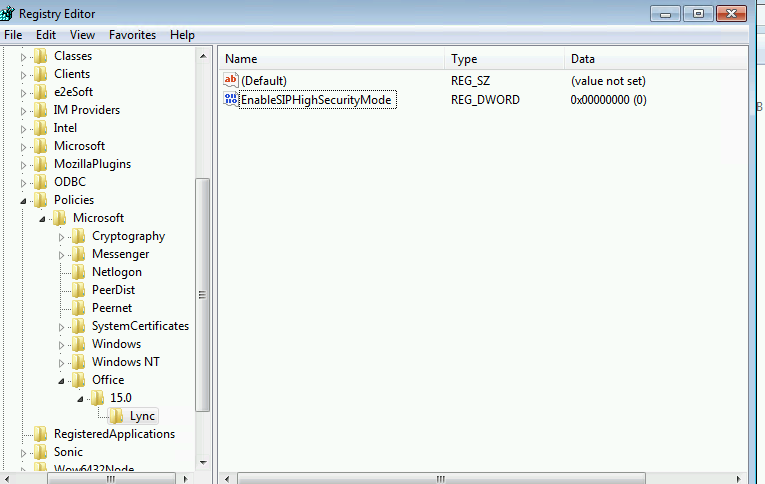 can from your Lync Mobile client log in with your user credentials. thanks for looking, and i hope it helps some of you out there. **Special thank you to Bhargav at Kemp for providing my Kemp Licence.! Today i was looking through the plethora of Lync certified bluetooth devices i have and also carry from site to site as part of my daily job of a UC consultant. It got me thinking that others could benefit from a rundown review of what each bluetooth headset can offer and which out performs the other. 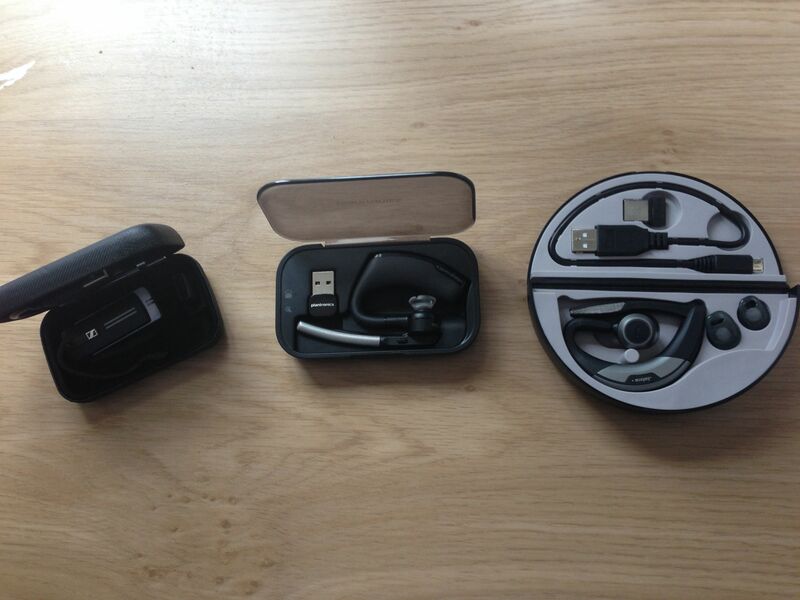 So for this blog post im putting up for review the following UC certified Bluetooth headsets i carry. Sound – The sound and audibles from the Presence device is simply the best out of the three devices without any doubt. I’ve used this in the car, a full office of talkers and it never misses a beat. Sennheiser are seeing this headset as part of there premium range of headset and i can understand why. 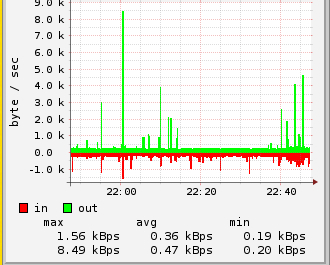 The call quality is great, using it both via a SIP trunk and connected via a Media Gateway for Lync calls it out performs the rest. Functionality – Sadly although it has three microphones to which it automatically chooses the best to suit the noise tones at the time of the call the Presence does lack some of the other features that both the Jabra and Plantronics have to boot. The Presence is capable (and ive tried it) of a call range of 25 meters from the PC attached mini USB dongle without any sound breakup. It also boosts the best of breed battery life at 10hrs talk time. Unbiased Verdict – if you wanted a headset for pure sound quality then i would stop reading any further within in this blog as the Sennheiser Presence is the device for you. However in the modern age of people wanting more, the presence does lack some of the now standard features what the other devices have. Thats said will i stop carrying the device anytime soon? no… it will be in my bag for tomorrows engagement. RRP – I don’t believe it has been announced yet but i would be guessing around £149 to match the other vendor offerings. Functionality – This is the big dilemma with doing this review each devices is the best in each catorgary. The Plantronics Legend has lots of functionality which i love to use and now just take it for granted until i plug in one of the others. The functionality which i think is worth a mention with the Legend device is…. Pick up to answer – You don’t have to wear the headset all the time and when a call does establish you simply pick up the legend and place on your ear. The device has a sensor which tells it when its picked up and it automatically answer the call for you. In case charging – So you can imagine you have used the device for calls throughout the day and the last thing you want is a dead device for the following day to come!? the neat thing about the Legend is it has a little battery cell within the carry case so once you’ve finished with it for the day you put the headset back into the case with the assurance that tomorrow it will have another 7 hours of talk time ready for you. (Also the case is magnetised so that ‘everything sticks’ so that little micro usb dongle will never drop out of the case while carrying.! If you are a desk user the Legend headset also comes with a little magnetic desk stand so at the times when you aren’t using it, between calls you simply place the headset onto the stand for quick contact charging. Plantronics has also placed within the device the ability for future tech upgrades to the software and rest assured they are coding some good updates for come. Caller announcement (telco dependant), the headset will tell you whos calling if you have their name in your address book. Usability – At this moment i would say the Legend is my headset default and i use it most days (this might change with more use of the Jabra Motion <1 week old>). Its shape and design suits me. The ear piece fits well with no outside noise leakages when in a call. If there is any real criticism about the legend it would be the bluetooth range and the battery could be better. Plantronics states the range to be 20 plus meters be ive found this to be a lot less, even in a open office. The battery life is 7 hours compared to the 10hours of the Sennheiser Presence. Unbiased Verdict – It hard to fault the Legend really. it does everything you would want from a headset. Like I’ve mentioned above the Legend is my current driver of choice. Sound – In my opinion the sound quality just falls short of the Sennheiser Presence, but still its very ‘very clear and near on perfect. One of the pros to this headset is a feature which the headset will adjust the headset speaker and earpiece sound based on the surroundings your in. Functionality – The Jabra Motion is up there with the Plantronics Legend AND better for tricks and features. so to mention a few..
Voice Control (Answer and End) if the headset is being worn at the time of a call. Custom Fit ear pieces. The Motion is the only headset to offer this.! Usability – As stated earlier in the posting, I’ve only had the Motion for less than a week so i cant honestly say ive put it through its paces, that said its been faultless to date. I like the ear pieces and the device sits nice on my ear. It terms of the tech, i personally don’t think the voice control will be something i would use AND the NFC option is just a joke.! (how many times do you need to pair your headset to your Mobile? Once!!). One dislike is the bulky hardcase it comes in? i wonder what the designer was thinking (or not thinking) when he/she created it. Again the Jabra Motion comes with 7 hours talk time. Unbiased Verdict – First impressions are excellent for the sound quality and also the wearing of the headset. The only reason why i didn’t use it today was that it was out of battery so i opted of the Legend which had a full 7 hours battery time due to the case. Like other UC Consultants i spend time in server rooms and telecoms rooms and the motion is ideal for taking a call when away from my PC. – If you are a person who spends hours on telephone and wants comfort with the assurance that the headset is always charged then the Plantronics Legend is the one. For me the headset i always look for first out of my bag is the Jabra Motion and the Plantronics Legend as both of these suit my work life. Following the recent Lync 2013 CU2 update release, this evening I thought id update my Lync 2013 client with all the new CU2 goodness. Problem is even though the update was successful I saw some of my icons become weirdlike and the wrong size, and were more in line with windows 3.1 than office 2013. On further investigation and after a full removal of the Lync client and the patch and reinstall, I thought it would be good to update my win8 machines windows patching. On running the windows update module it came back with an update for Office and also a update for Windows 8. (the one of interest is the Office update KB article stated in the update is http://support.microsoft.com/kb/2817489). when you read the KB the second item for the fix is the icons, therefore it became a no brainer to run these in. <sorry im unable to screengrab the updating> (expect a reboot after the update)! So following the reboot the icons looked good again. In this blog post I will run through the two ways you can add the custom Lync presence status to your company Lync users estate or to your own personal Lync 2013 client. 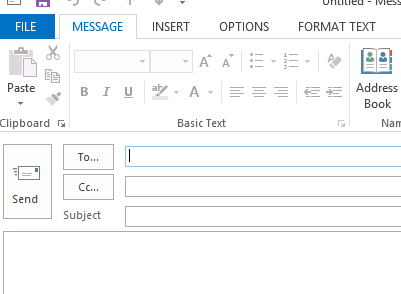 In this post im going to copy the file to the Lync frontend in my lab. (NOTE: you need to copy it to a server/desktop which has webserver enabled and working. Once your added and tested the path and it returns the custom states in a IE page then you are good to continue. If you don’t get the custom states then you need to jump back into IIS and fix your Virtual directory folder path. 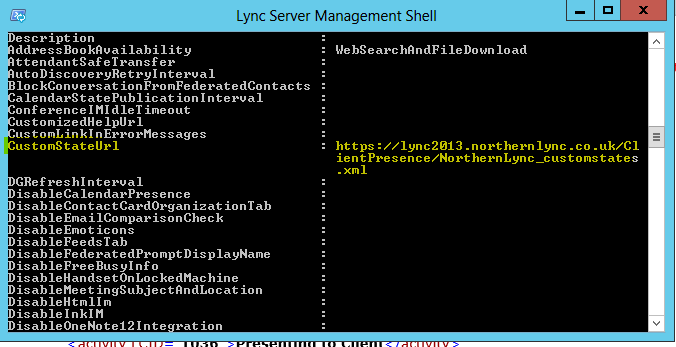 Now we need to go into the Lync Management Shell on the Lync 2013 frontend. At this point we can do one of two things. 1, we can add the custom presence to an existing client policy or 2, we are required to create a new Client Policy. We now need to assign the policy to a user. again using powershell you need to grant the policy using the following command Grant-CsClientPolicy -Identity “<username>” -PolicyName <nameofcustompolicy>. eg: Grant-CsClientPolicy -Identity “Iain Smith” -PolicyName NorthernlyncCustomStates. 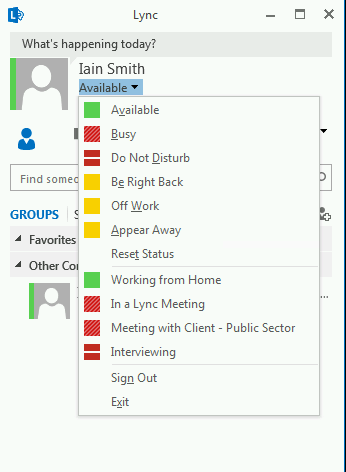 There you have it.. a Lync Client Policy based Custom Presence. 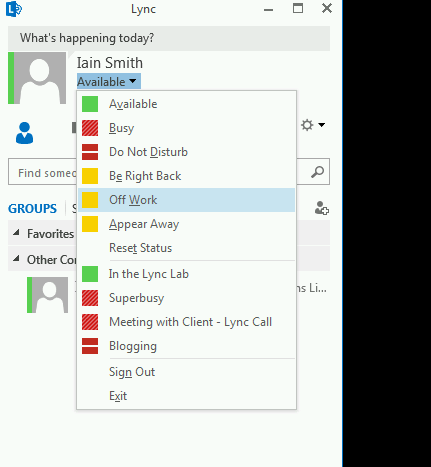 Now lets look at a way you can do it a an individual user of Lync. – I would go as far as saying this option would always a secondary option, and im just detailing it for this blog and would never suggest it to one of my customers. We need to go into the registry now and add the paths into the folders for the Lync client startup process to hook into them.